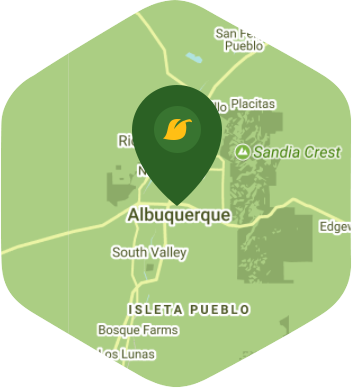 Book a skilled lawn pro in Albuquerque. Backed by a total satisfaction guarantee and amazing customer support. Imagine a place where you get more than 300 days of sunshine a year and mild sunny winters. That place is none other than Albuquerque, NM. As a matter of fact, the weather is one of the reasons why a lot of people enjoy living here. That and the fact that the city has plenty of restaurants, museums, and parks to keep one busy during the weekend. You want to enjoy the city's weather and numerous attractions, but your yard has some weeds that need to be dealt with. The good news is you won't have to cancel your weekend plans anymore because Lawn Love is here to help you with that problem. Even the peskiest and most stubborn of weeds will be no match for our group of seasoned and highly skilled lawn pros. We only use selective herbicide spot treatment when eliminating weeds as this is more effective and helps keep the weeds away for a long time. Our affordable weed control service can be scheduled easily through our website or mobile app. We are confident that we can give you the kind of service you're looking for. Get started by requesting a free online quote, or call us at 505-207-4954. Did a great job. Very professional. Very courteous and helpful; said she'd come back after a few days if anything surfaced back. The lawn never looked better. Thank for getting all the weeds mowed and edged around my sidewalks. I hope we get have an understanding that my lawn is to be cut on Fridays and we don’t have a repeat of the chaos we had yesterday morning. The only issue that I need assurance of is CONSTANCY OF SERVICE. ..... NO SURPRISES!!!! Rated 4.87 / 5 stars in 97 Albuquerque customer reviews. A healthy lawn is the first step to controlling weeds. A thirsty lawn isn't healthy! There won't be any rain in Albuquerque today, which means you'll probably have to water your lawn. Dusk and dawn are the best times to water your lawn (the sun will rise at 6:30 AM and set at 7:41 PM today in Albuquerque). Prices vary depending on the size of the area to be treated and frequency of your service. Here are some average prices for homes in Albuquerque. Average size of area treated 3,780 sq. ft.